It is Wednesday night, so it is Celtic Winter time. Tomorrow my mom is coming down and we are going to the outlet mall in Leesburg and have lunch at Panera. I need to get some new work clothes and it will be nice to spend some time with mom. 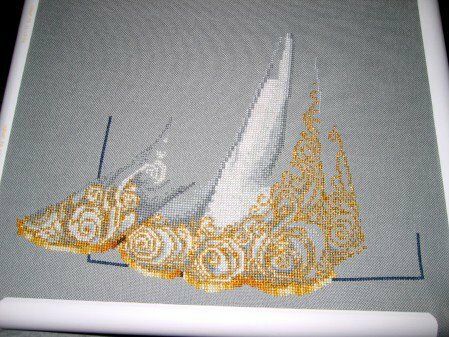 After that I am going to spend the evening working on White Wedding. Ah, CW looks great – I love how all those swirls came out at the bottom of her skirt! Ooooh…..your work is just beautiful!! I don’t envy all that work with the gold..that coming from a person who hates working with metallics! You must have a good tip or two for using it!